Realignment of the bus laybys so that buses can park off the road and reduce traffic congestion. New bus shelters to improve the experience for bus users. Enhancement of the existing crossing points between Boyle Cross and the Coventry Building Society, and Boyle Cross and The George Hotel by installing wider pavements and coloured road surfacing where pedestrians regularly cross now. The existing zebra and pelican crossings will remain. Improvements to the pavements to enhance the appearance of the Market Place and make it more pedestrian friendly. A new loading bay outside The George Hotel to improve the facilities for town centre businesses. Improvements to the on-street parking facilities for disabled drivers in Cork Street. This will include 2 new spaces and lower kerbs to enable ease of access for those in wheelchairs/buggies from cars to pavement.There will also be a new disabled parking space in the Market Place outside Fat Radish. Removal of the railings on the junction of Cork Street and Market Place and their replacement with bollards. Earlier consultation has suggested that it is important for us to address the congestion caused by the alignment of the bus stops in the Market Place, to make the area more pedestrian friendly and a more attractive place to shop, work, live and visit. What will the scheme look like? Please follow the links to see an illustrative layout and visualisations of how it will look. What consultation has been undertaken? 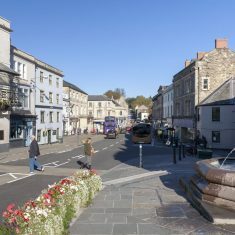 Frome Town Council has worked with the community over many years to explore options to enhance the public realm within Frome Town Centre and particularly around the Boyle Cross monument and Market Place. Landscape Projects were commissioned by Frome Town Council in 2012 to undertake a feasibility study into the options for remodelling the Market Place and this study was subject to wide public consultation. Those consulted included town centre businesses and users, residents of Frome, District and County Councils. Following the early feasibility work, there were various public exhibitions and meetings as the proposals for public realm works developed. All this culminated in the approval of and completion of the Phase 1 Boyle Cross improvement works in February 2018. More recently in November 2018, the Town Council published its plans for Phase 2 of Market Place public realm works and conducted a public consultation exercise that included an exhibition at the Town Hall and online/press publicity. 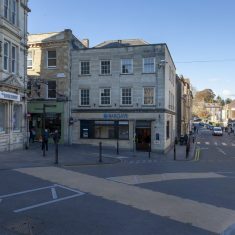 We also consulted with various stakeholder groups including Frome & District Chamber of Commerce, Frome & District Civic Society, town centre businesses, PACE (representing the interests of the disabled), bus operators and the police. Comments were considered carefully and in response to the comments received, various amendments to the plans were agreed at a meeting of the Town Council on 23 January 2019. Follow this link for further details of the submitted planning statement: Planning Statement. What status will the enhanced and informal crossing points have? As is current practice, those using these crossings will need to either cross when the road is quiet or will need to gain the attention of drivers to allow them to cross typically when traffic has slowed. How will these crossings make it easier for pedestrians to cross? By widening the pavements, we will shorten the crossing distances in these locations and by providing buff coloured road surfacing and additional road markings we will alert drivers to the fact the these are popular informal crossing points. How do we know that the crossing proposals are safe? They have already been the subject of a thorough safety audit by Somerset County Council as Highway Authority who have indicated that they consider that the proposals are safe. What will happen to the existing zebra crossing in Cork Street, and the pelican crossing in the Market Place? These crossings will remain in position as it is recognised that they are already well used and not everyone will wish or is able to use the informal crossings. Why are you removing the railings on the junction of Cork Street and Market Place? This is to aid in the movement of pedestrians within the general area and remove the risk of pedestrians becoming caught on the carriageway side of the railings during traffic movements. The railings will be replaced by carefully positioned bollards that are designed to protect pedestrians on the pavement. The St Aldhelm motifs will be carefully removed and stored and will be used elsewhere in the town in a location to be confirmed. What is the proposed paving specification? In most of the new paved areas we propose to use Tegula Pennant Grey which is designed to match the Welsh Pennant slabs laid in the Boyle Cross area and the existing paved area outside Costa and Superdrug. The exception to this arrangement will be outside the Coventry Building Society and Barclays Bank on the junction of Stony Street and Market Place, where natural Welsh Pennant Stone slabs and setts will be used to match existing materials in Stony Street. To see where these materials are going to be used please refer to the illustrative layout. Why is there no new planting or seating proposed as part of this phase? Options were considered at the last consultation stage but there was no clear preference for any of the options. In response to discussion with PACE, the police and town centre businesses, it was decided that the Town Council would monitor how the new paved areas are used before coming forward with any new proposals for planting and seating. When will the next phase of work taking place? This has not yet been resolved by Frome Town Council, but the expectation is that work will start in 2019 on a date to be confirmed. Before work can start planning consent from Mendip District Council, as the planning authority, will be needed. A planning application has been submitted but it is uncertain as to how long it will take before permission is granted. Where can I view the planning application and how can I make comments? How are you planning to minimise disruption during construction? The work will be undertaken in phases to be confirmed with Somerset County Council. The Market Place will remain open for through traffic and all car parks will remain accessible. Arrangements will be made to enable customers to access businesses and ATMs whilst the work is in progress. Temporary bus stops will be created to enable buses to continue to operate in the Market Place, the precise locations to be confirmed. Traffic management arrangements will keep queuing to a minimum. At the moment, the plan is to introduce a one-way flow between the junctions of Bridge Street/Market Place (by the Museum) and Cork Street/Market Place but this plan is subject to approval by Somerset County Council as highway authority. Are you going to dig up the Boyle Cross area again? With the exception of the installation of new tactile strips and bollards for the new crossings, this area will be unaffected by the works. It will remain open to the public and for markets and other events throughout the works. How much will the scheme cost? This will depend on the outcome of final negotiations with Somerset County Council as the Highway Authority, the planning process and tendering. Further details will be brought to a meeting of the Town Council as soon as possible. In the meantime, the Town Council is preparing to invite tenders and further details will be published shortly. Who can I approach for further information? Please contact Peter Wheelhouse, Deputy Town Clerk, Frome Town Council or Jane Llewellyn, Planning & Development Manager at info@frometowncouncil.gov.uk or on 01373 465757.